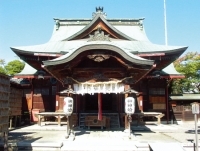 Chiyo Shrine is dedicated to two Shinto gods, Ame-no-Uzume-no-Mikoto and Sarutahiko, and has been designated as a nationally Important Cultural Property for the nagare-zukuri (streamlined gable style) of its main hall. The gods enshrined here are said to be the ancestor gods of the arts and performance. Chiyo Shrine also receives many visitors coming to visit this guardian shrine of the Ii family. Ame-no-Uzume-no-Mitoko in particular is a deeply revered deity, and is worshipped as the ancestor god of acting and the arts. Even now, the shrine is visited by famous actors and those involved in the arts, who come to pray for improvement of their skills.